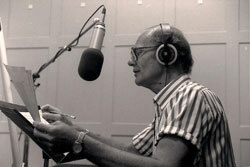 Nightsounds originated in Chicago as a nightly, local radio broadcast of Moody Bible Institute's radio station, WMBI. The focus of the program was to reach those individuals who, by the Lord's divine providence, would be searching the radio dial for something that would help to relieve their stressful, troubled spirits. The program would feature suitable music for this night-time audience, along with the unscripted comments and Biblically based insights of host Bill Pearce. Bill started in radio at WMBI following World War 2 as a member of both the Melody Four and Sixteen Singing Men singing groups. The Nightsounds program quickly gained a broad listening audience not only among believers, but with cynics and agnostics as well. When Bill left WMBI in the early 1970's, the program had expanded to nearly 100 stations that carried the program. Today NightSounds' office is located in Rockford, Illinois, and the program is broadcast each night over more than 300 AM/FM, satellite, cable, and translator outlets across the U.S., Canada, and overseas. You may also listen to the program from our web site, nightsoundsradio.org. We are also excited about the new APP which you may download for free and listen from your IPhone or IPad. Over the years, Bill became well known as a radio personality, as an accomplished musical recording artist who produced several albums, and also as an author. In 1992, Bill was inducted into the National Religious Broadcaster's Hall of Fame. He received this award at the NRB's 49th Anniversary Banquet in Washington, D.C. This tribute is presented to a few select Christian broadcasters, who have achieved wide recognition in the field of electronic media, with the highest standards of quality and integrity. Nightsounds is a not for profit ministry. Many listeners ask how the numerous parts of the ministry are financed. The answer is very simple. Listeners send regular gifts to Nightsounds. This is the sole source of funds to keep the broadcast on the air. We are dependent on the support of listeners...regardless of how small or large the gift.